Earle Mitchell was born in Yeovil in 1893. He was the son Job Mitchell, originally from Fordington, near Dorchester, Dorset, and his wife Sarah. Between 1897 and 1912 Job was licensee of the Wellington Inn in Wellington Street. In the 1901 census he described his occupation as carpenter and inn keeper and lived in the Wellington with Sarah, and their three children: Percival (b1891), Earle (b 1893) and Hilda (b 1898). By the 1911 census the only difference was that Job described his occupation as carpenter and 18-year old Earle described his occupation as a cycle fitter but is known to have worked at the Nautilus Works in Reckleford. As a keen footballer, Earle was captain of the Nautilus Works' Reserve Team. By 1914 Job was licensee of the Britannia Inn, where he was to remain until at least 1923. Earle enlisted in the Army at Yeovil when war broke out and became a Private (Serial No 240835) in the 1st/5th Battalion of the Somerset Light Infantry. He enlisted with John Pound (Service No 240833), Ernest Luffman, (Service No 240834) and Donald Matthews (Service No 240840) - all four served together in the same unit. The 1st/5th Battalion was a Territorial Battalion formed on 4 August 1914 at the County Territorial Hall, Taunton as part of the South-Western Brigade, Wessex Division. It was initially stationed at Plymouth for a few days and then proceeded to Salisbury Plain. On 9 October 1914 the Battalion, including Earle Mitchell, sailed from Southampton and arrived at Bombay, India, on 9 November 1914. The battalion remained at Jubbulpore until December, when it proceeded to Ambala. Strenuous training began almost immediately and continued almost for the next year. In May 1916 a large draft of nine officers and 449 other ranks arrived from England. The battalion was temporarily divided during the ensuing hot weather with some companies going to Chakrata and the remainder to Meerut. The following months were mainly occupied in training the draft but even in the hills little was done beyond this owing to the exceptionally wet season. The Battalion was reunited in October at Meerut. On 26 April 1917 17 officers and 838 other ranks of the Battalion sailed on HMT Chakdara from Bombay, landing at Suez, Egypt, on 11 May 1917, becoming part of 233rd Brigade, 75th Division - part of the Egyptian Expeditionary Force in Palestine. For two hours during the early morning of 21 November the village of Enab was shelled heavily by the Turks and, owing to the congested state of the village -packed with troops and animals - casualties were heavy. On 23 November 1917 the 1st/5th Somersets of the 233rd Brigade had again become involved in stiff fighting with the enemy who was posted in strong positions at Nebi Samwil. The Battalion, which had gone into action on the 22nd November about 450 strong, had suffered 221 casualties in the two day's fighting - 3 officers killed and 6 wounded, 51 other ranks killed or missing and 161 wounded. Earle Mitchell was among those killed in action on 23 November 1917. He was aged 24. On 14 December 1917 the Western Gazette reported "Private Earle Mitchell, son of Mr and Mrs J Mitchell, of the Britannia Inn, was killed in Palestine on November 23rd, when serving with the Somerset LI(T) and much sympathy has been expressed with the bereaved parents. As a boy he was a chorister at the Parish Church, and later, when going into employment at the Nautilus Works, was a keen footballer, and was captain of Nautilus Works’ Reserve Team." 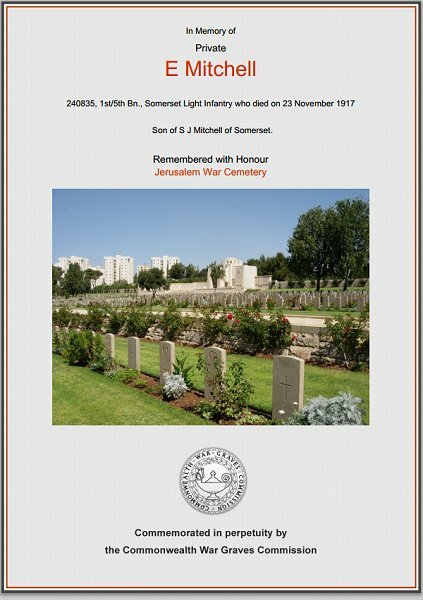 Earle Mitchell was interred at Jerusalem War Cemetery, Israel, Grave B.78. His name is also recorded on the War Memorial in the Borough. The Commonwealth War Graves Commission certificate in memory of Earle Mitchell.